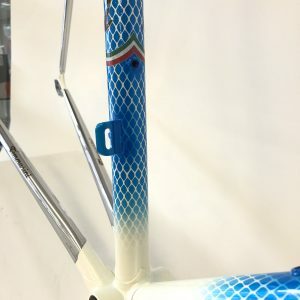 We recently had a Tommasini Super Prestige frame and forks in for renovation and it was a complex paint finish, with a lot of processes and time for Mark and Rob in the sprayshop, so we thought you might like to see a bit of the process. 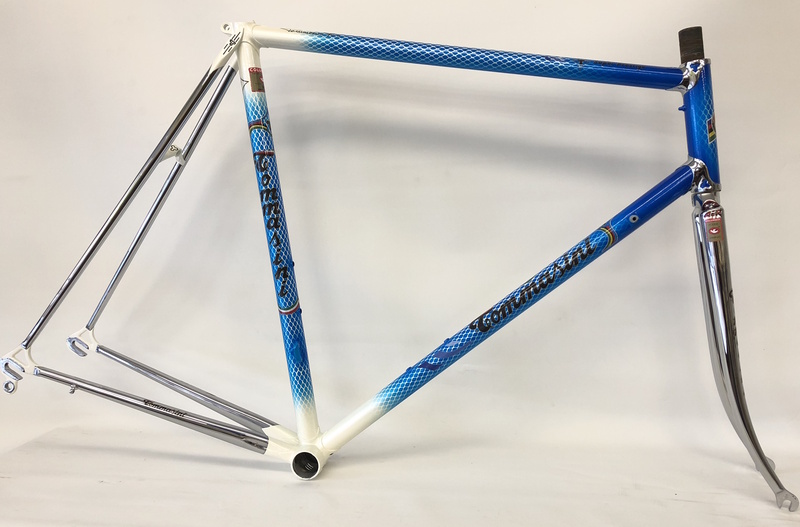 Frame arrives at the shop, renovation form completed and over to the workshop for the renovation. 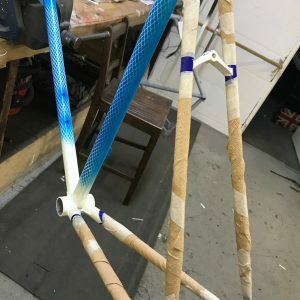 First job – take lots of photographs of the frame, forks and transfers and into the frame preparation area for paint removal, frame repairs done in the workshop and it’s into the sprayshop. 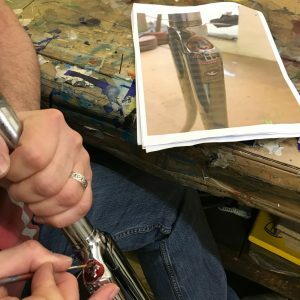 Chrome masked up and Rob sprays the etch primer undercoat, rubs it down by hand and it’s on with the White Pearl main finish. 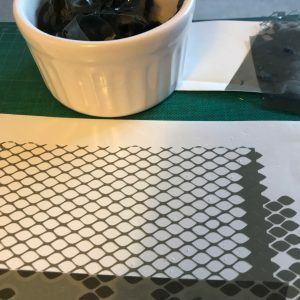 Originally the blue pattern on the top of the White Pearl would probably have been done with a fishnet stocking over the top and sprayed through, but we wanted a more precise finish, so we drew up the design with our graphic design program and tried a test piece with stencils. 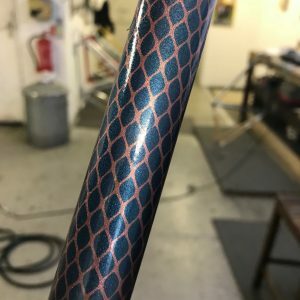 The stencil took ages to pick out and left hundreds of stencil fish-scale bits of vinyl all over the office but when we tested it on a random tube – looked pretty good. 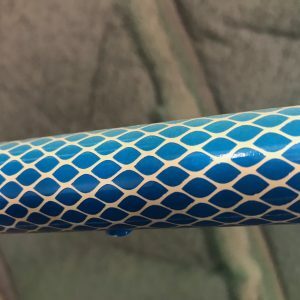 So to remove another few (seemed like) thousand ‘fish scales’ for stencils for the top tube, seat tube, down tube and head tube. 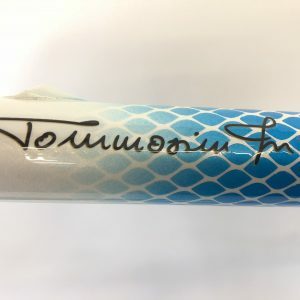 Tricky job for Mark to fit the delicate stencils along the tubes before airbrushing blue flamboyant paint over the top, leave the paint for the right amount of time before removing the stencils with the paint still wet (tricky!) 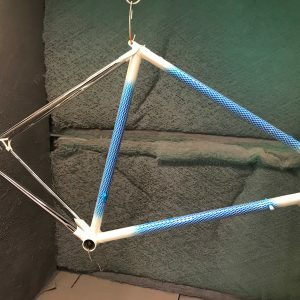 before stoving the frame in the oven to cure the paint. 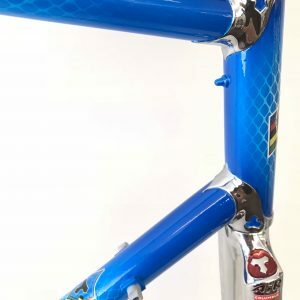 Mark then re-masked the all the chrome and airbrushed the more intense darker blue areas at the front end of the frame, on the head tube and underneath the tubes. Stove the frame in the oven again. 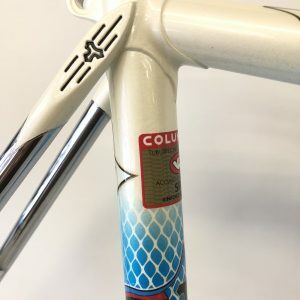 Transfers are fitted and a few coats of clear gloss varnish finish the frame off nicely. 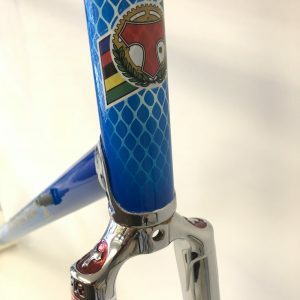 Final job is to paint red flamboyant into the logos on the shoulders of the fork crown, a final stoving in the oven and the frame is ready for chrome de-masking and over to the shop for the threads to be cleaned out and packed up ready for the customer. 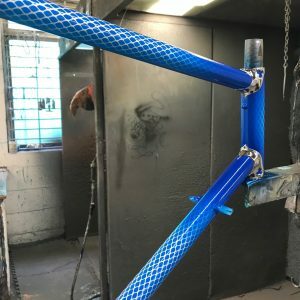 We’re proper chuffed with how this frame looked when it was done, Mark and Rob did a great job in the sprayshop. We’re pleased to hear from the customer who told us he is really happy with the finished renovation, which is what it’s all about!